The treatment unit of the Actus series has been installed in over 10,000 practices worldwide providing support to both dentists and assistants. The success of the Actus treatment unit is easy to explain: quality at a reasonable price and maximum functionality. 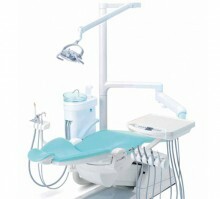 The treatment tray incorporates swivel and height adjustment. It allows optimal access to all instruments including the control console for the chair and instrument functions. Click the button below to add the J Morita Actus 101 Dental Treatment Unit with Chair to your wish list.